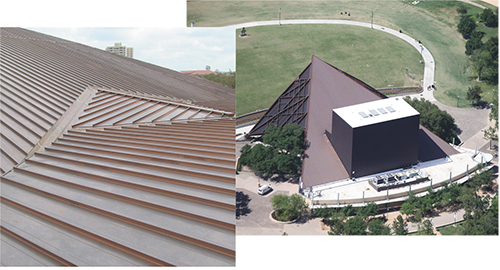 What served as a canopy-style roof at the Miller Outdoor Theater in Houston, TX, needed repairs in short order. Tasked with that job, Byrne Metals installed more than 18,000 sq. ft. of copper 238T standing-seam panels during the theater’s 5-month offseason, thanks in part to a rollformer from McElroy Metal, Bossier City, LA, that ran panels right onto the roof deck. This 2013-14 multi-million-dollar renovation served to correct canopy deficiencies that caused leaks above the stage as well as the audience, putting a damper on the theater’s cultural and educational offerings. And for more than 40 years, due to heavy Texas rains, anyone hired to permanently repair the roof of the iconic structure had failed. Schaack chose the 238T symmetrical panels from McElroy Metal for this project. Byrne Metals went to work as soon as the 2013 season concluded in early November. “It was a very challenging job,” says Neil Byrne, president of Byrne Metals, Humble, TX. Improvements included replacements of the east and west wings, a new soffit for the main sloped roof and the new 20-oz. copper standing-seam roof. The profile was McElroy Metal’s 238T panel. McElroy Metal’s jobsite production equipment simplified the process of installation and made the jobsite safer. The rollformer was hoisted to the eaves on a scissor lift where panels were conveniently run onto the roof then cut to fit. This method not only eliminated the need for an expensive crane to lift panels to the roof, but was deemed safer as some of the panels measured to 110 ft. long. See also: McElroy Metal Mill Inc.